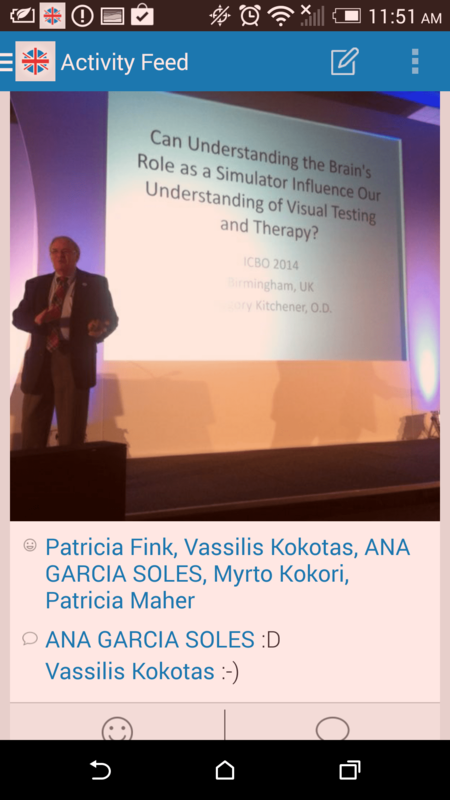 I had an absolutely amazing time at ICBO 2014 in Birmingham, England this past week. I had one of the most rewarding experiences of my career serving as the head of the digital media strategy for the conference. Our ICBO Social app was a tremendous success that far exceeded my expectations. The positive feedback was off the charts! When we decided to go “all in” on an interactive mobile conference app, I knew it was a tool with a great deal of potential. Since it is its own social network centered around the conference, I believed the tool had unique advantages over relying on dispersed platforms like Twitter and Instagram. But, would people use the social features of the app? OR, rely on what they’re used to – i.e., Twitter. There were several hurdles and questions. The attendees at ICBO ran the gamut in terms of age and technological familiarity. A good number of them are older. Would an older optometrist who doesn’t use social media in his daily life or for his business use this tool? Would people have no interest in the social features – finding them superfluous, or worse, a distraction from agenda and other information? In short, would people “get it”? And I worked very hard to address these and several other issues in building my plan for this event. To my delight, the conference attendees and nearly all exhibitors (as well as many speakers) enthusiastically adopted the ICBO Social app. Anecdotal feedback suggests the app served as a great icebreaker, enabled attendees to forge new and more robust connections with one another, and truly enhanced engagement with the speaker sessions and speakers themselves by enabling meta conversations and because we used the app to solicit questions that the speakers responded to during Q&A. We had an amazing group of attendees – and their energy, friendliness, and passion for their profession played a big role in the success. Here are the final stats for the 5 and 1/2 days (2 days of pre-conference and 3.5 days of conference). You may have noticed I haven’t been on Twitter lately. 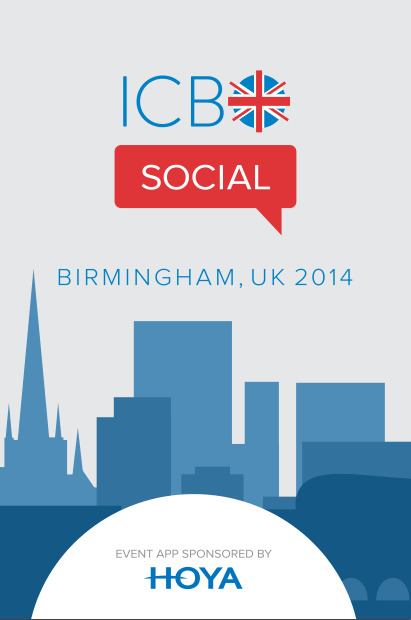 I am here in Birmingham, UK working the social element of the ICBO 2014 conference. It has been super busy and a wonderful experience! I thought I’d write a quick post as the conference is getting very busy today with the exhibit hall opening and the second day of the preconference lectures. 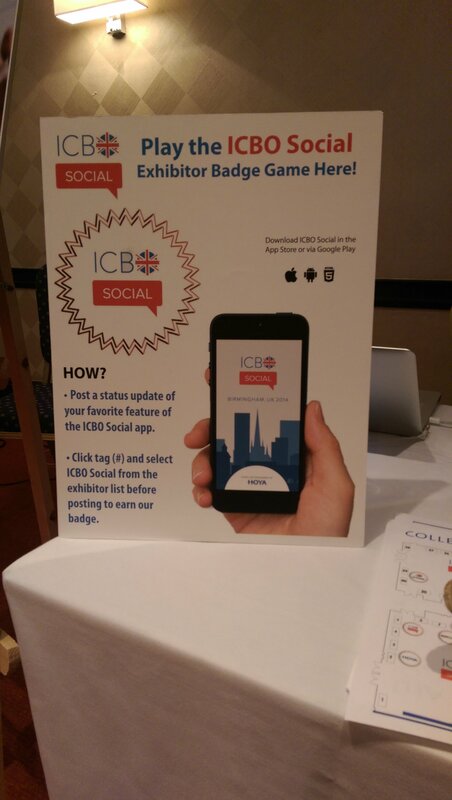 Our ICBO Social mobile conference app (available in the app store – but only availabe to attendees, speakers, and exhibitors) has been a roaring success so far! The app was released about a week prior to the start of the preconference – the preconference has been going on yesterday and today. And in the days leading up to the preconference, we had already earned some very strong engagement! The conference hadn’t even started, with only few folks having arrived. and already we had 593 comments, 309 status updates, 245 photos, and1594 likes. After our first day, we gained 67 more photos, 97 more comments, 246 more likes. That is great considering most attendees haven’t yet arrived – only a percentage of people attend the preconference. As people have arrived today and yesterday, they’ve already known others via the app. And this has been a great “icebreaker” and networking lubricant. That’s all for now! I hope all is going great! As you know, one of the big projects I’ve been working on this summer is creating and executing the social media event plan for the International Congress of Behavioural Optometry (ICBO) conference in Birmingham, England this September. This project, which was sponsored by the Shepherd University Foundation, has been a lot of fun and a great learning experience. I’ve been working with the Optometric Extension Program Foundation (OEPF) who is organizing the conference. OEPF is an international nonprofit that does important work advancing the discipline of optometry. I thought I’d take a moment to post a status update on the project. After completing the social media plan for the event, the majority of the work has focused on preparing the ICBO 2014 conference app to create an app that helps OEPF meet its goals. The app is titled ICBO Social and works on iPhone, Android, and HTML5. Once complete (I hope to finish building the app over the next few weeks), we’ll move onto promoting the app as the primary means of social engagement at the conference. We’re also presently working to get buy in from key stakeholders: exhibitors and speakers. The reason the app is our primary social tool and centerpiece of the plan is because (as I like to say) ICBO Social is no ordinary conference app. OEPF and I have been fortunate to be using DoubleDutch as the platform to build our app. DoubleDutch is doing amazing things pushing the envelope on conference apps and what they offer is like no other conference app I’ve seen before. ICBO Social (and all DoubleDutch apps) is a comprehensive social network built around the conference and thus exclusively for conference goers. So attendees won’t just be seeing an agenda, or have the ability to create their own schedule, or see a list of exhibitors. And they won’t be limited socially by Twitter feeds. While it has these features, the app is really designed for the social interaction to occur within the app itself. It contains an activity feed (like Facebook or Twitter) where you can see what other attendees are posting (comments and photos), liking, and where they are checking in. Gamification is a great part of the app. Users are rewarded for their app activity. They can earn badges (like on Foursquare) for checking in, posting photos, and more. And, they can earn points for in app activities. I will be creating custom badges and designating higher point values for certain behavior to encourage desired behaviors. There is also a leader board app users can check to see how many points they’ve accumulated in comparison with others. And we may use those points to give prizes as further incentive to use the app. Each individual has a robust profile that shows their activity, what badges they’ve earned, and connections to their social media accounts. The app also encourages deeper engagement with exhibitors. Attendees can check in to exhibitor booths, share photos, leave comments, etc. Given these abilities, features of the app can be harnessed depending on what the exhibitor is looking to achieve. The app also enables us to easily get feedback from attendees by the use of surveys and ratings. We also plan on using the app to bolster our Q&A speaker sessions at featured speaker events in order to give more attendees the opportunity to ask questions. 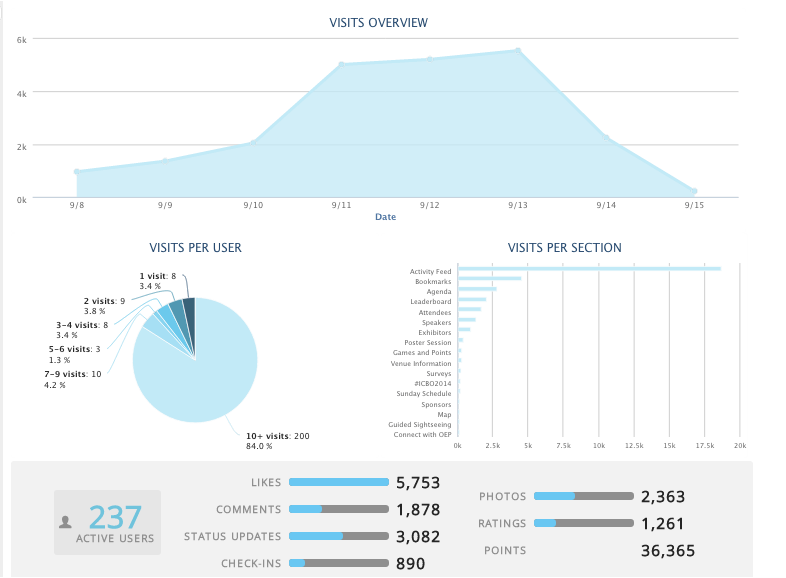 Lastly, we talk a bit about analytics on this blog. By driving activity within the app (as opposed to encouraging its spread it across social networks), I’ll be able to get a more comprehensive look at engagement via the app analytics in the CMS – such as # of check ins, what events people checked into the most, top contributors, and other engagement metrics. Having been to many conferences and used social media at many and many conference apps, I know the value of being able to connect and stay current with the conversation at the event. I believe using this app will greatly enhance that experience by centering it and making it super easy for participants to stay up to date with and be a part of the conversation. All of these things will enable ICBO attendees to network, interact, and build lasting connections and thereby further establish the ICBO conference as a highly valuable must attend event. While the app is the major focus of the social media engagement experience of the conference, we’ll also be encouraging attendees to discuss ICBO 2014 on external social media channels as ways to build excitement before the event, continuing the conversation after the event, and, importantly, increase awareness of ICBO among the wider optometric community and non attendees. It is exciting to see how the DoubleDutch platform is enabling us to create a true, encompassing social experience for attendees and I’m very fortunate to be learning and using this cutting edge tool. Note: The app is sponsored by HOYA and the app splash screen shown above was designed by one of their very talented graphic designers. It is hard to believe that the 2013-2014 academic year is over. Summer is upon us. It was a super busy year. I had so many ideas for things I wanted to blog about, and never got around to: Like my final project in Communication Research where students build surveys and use iPads to collect survey data around campus. With summer here, I thought I’d take a moment to highlight my big plans for the summer. This summer I earned a grant via the Shepherd University Foundation at Shepherd University to complete some exciting and important volunteer work. I will be working to help the Optometric Extension Program Foundation (OEPF) create and execute a social media plan for the International Congress of Behavioural Optometry, the premiere international conference in the optometric community. The conference is held every four years and this year’s event is in Birmingham, England in September. The Optometric Extension Program foundation, an international 503c non-profit, OEPF helps advance the discipline of optometry by helping educate optometrists and their staff in addressing learning related visual problems (including performance as well as concussions), sports vision, vision rehabilitation, etc. They also do outreach to the public about these issues. Planning the social media is going to be a lot of fun and a lot of work. And we are just getting started. A major component of “ICBO Social,” our social media efforts, will be creating a conference mobile app aimed at really bringing the conference experience alive with exciting engagement opportunities for attendees to interact with the conference and one-another. While most conference apps simply provide a way to get the conference agenda on their smartphone, the ICBO Social app is so much more (we’ll be using DoubleDutch to create the app). The ICBO Social app is inherently social and aimed at interaction. The best way to describe ICBO Social is as a social media platform for mobile devices (available on Google Play and the App Store) that we are creating for and will be specifically used by conference attendees and exhibitors. That creates opportunities for attendees to build profiles, connect with one another based on interest, share comments and photos to the activity feed, see what events others are attending and commenting on via the activity feed, like and comment on others’ posts, learn more about exhibitors, and build real connections with exhibitors through the interactive opportunities popular on many social media platforms. It will be an easy-to-use, fun, engaging, and rewarding way to get the most out of the ICBO 2014 conference and build lasting relationships. While the app is the centerpiece of the plan, there are a host of other components that could be their own blog posts themselves! Over the summer, I will not be blogging as often. But I will post from time to time on my progress with ICBO Social along the way, as well as discuss other projects (I’ve got a few exciting research projects I’m working on), updates from my classes, and hopefully some fun posts about a few vacation trips I’ve got planned, etc. Not to worry – I will be picking back up full swing with weekly or bi-monthly posts in the Fall. In the meantime, keep in touch via Twitter or LinkedIn, blog comments, or email. I will see you all in a few weeks!